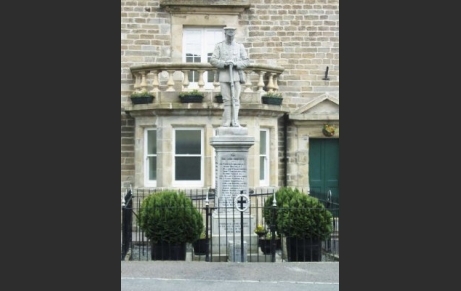 Robert was born on 19 December 1892, son of Robert and Emma Hodgson, who ran a grocer’s and draper’s shop in Ireshopeburn. He had two brothers and one sister. Robert attended Wearhead School from 26 April 1898 to 5 July 1907. His father died in 1909, and, in 1911, Robert was working in the shop with the rest of his family. Robert seems to have originally joined the Royal Army Medical Corps (RAMC). He was then served with B Company, 20th (County of London) Battalion, the London Regiment in Egypt and Palestine, and was seriously wounded in the attack on Jericho. He died of his wounds on 21 February 1918, and is buried in the Jerusalem War Cemetery. He was awarded the British Star Medal and the Victory Medal.